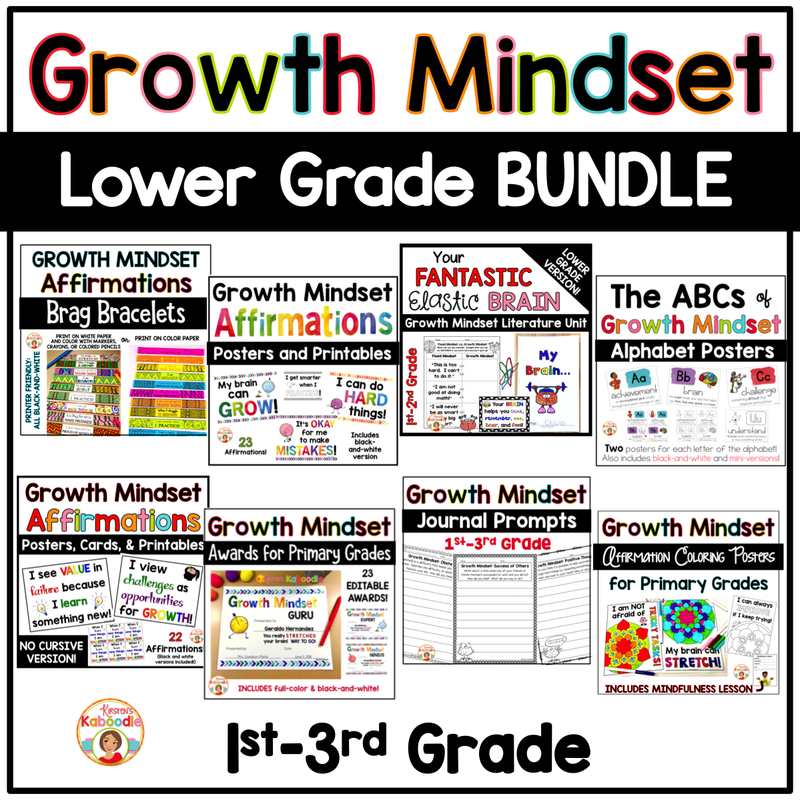 This Growth Mindset Activities Bundle includes EIGHT of my most popular growth mindset products for lower elementary grades! 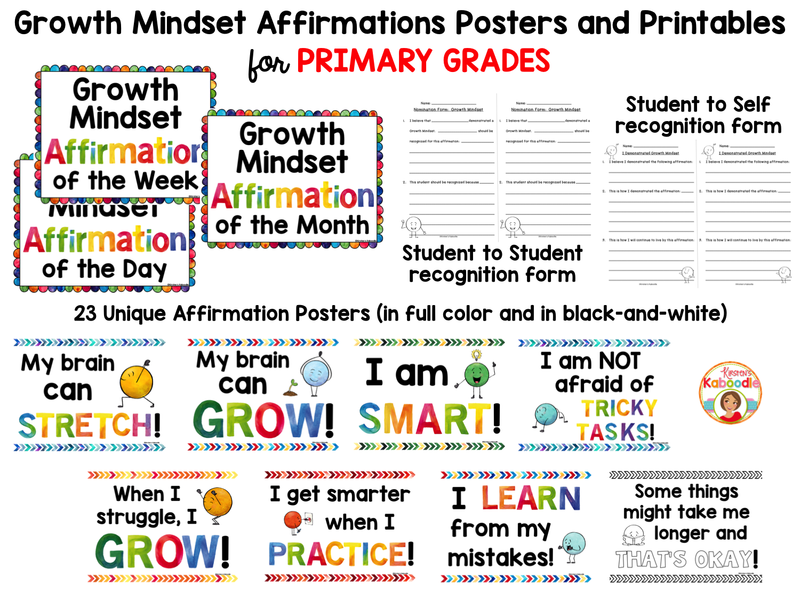 This bundle contains affirmation posters (watercolor), affirmation posters with no cursive, growth mindset affirmation coloring pages, awards, brag bracelets, a literature companion for Your Fantastic Elastic Brain, the ABC’s of growth mindset, and journal prompts. That is a total of EIGHT individual products. Mindful coloring with growth mindset affirmations! Create a culture of success, perseverance, and motivation! These growth mindset coloring pages with positive affirmations will reinforce your growth mindset instruction and are perfect for any classroom bulletin board or display for Kindergarten, 1st grade, 2nd grade, or 3rd grade. BONUS: You will find a mindfulness lesson called Mindful Coloring. Use this lesson as a part of your mindfulness curriculum or during particularly stressful times, like end-of-year testing. Create a culture of success, perseverance, and motivation! 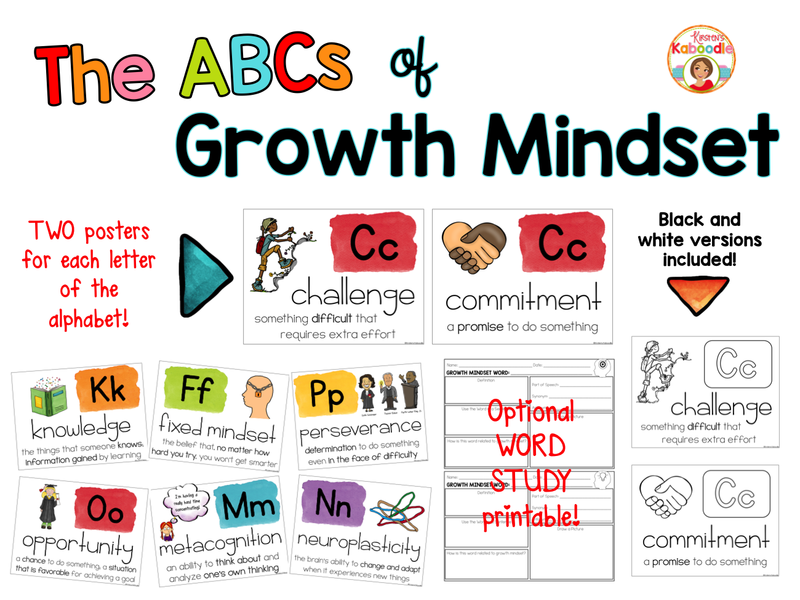 Are you a Kindergarten, 1st, 2nd, or 3rd-grade teacher looking for growth mindset posters? 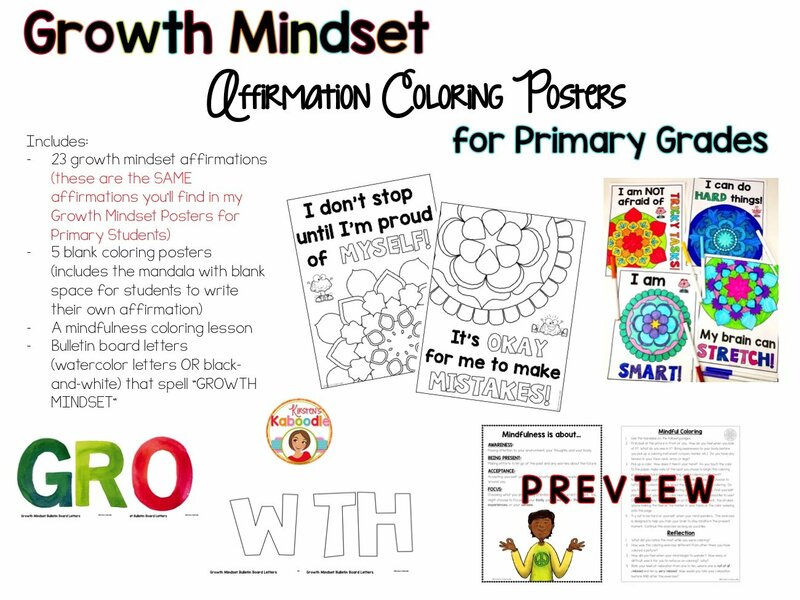 These watercolor affirmation posters for primary grades will kick start your growth mindset instruction and are perfect for any classroom bulletin board or display. 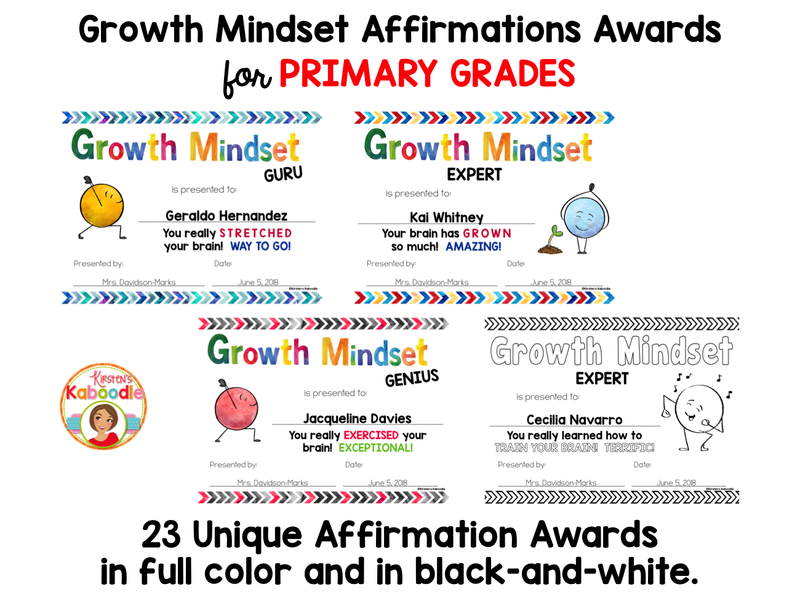 These growth mindset awards certificates are perfect for the end of the school year! 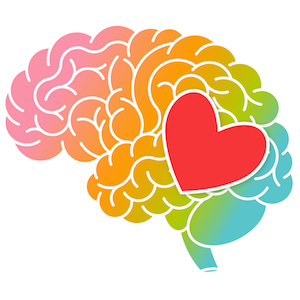 Are you a Kindergarten, 1st, 2nd, or 3rd-grade teacher looking for growth mindset awards? These watercolor affirmation awards for primary grades correspond PERFECTLY with my Growth Mindset Affirmation Posters. These awards are the perfect way to recognize your students for their efforts towards becoming growth mindset masters! There are 23 awards in full-color and in black-and-white. PLEASE NOTE: THERE ARE THREE EDITABLE FIELDS ON EACH AWARD: THE STUDENT NAME, THE TEACHER NAME, AND THE DATE. The other text on the awards is NOT editable. These Growth Mindset Journal Prompts are perfect for any 1st-3rd-grade classroom. This product was created for students and teachers who are working on growth mindset in their classrooms. 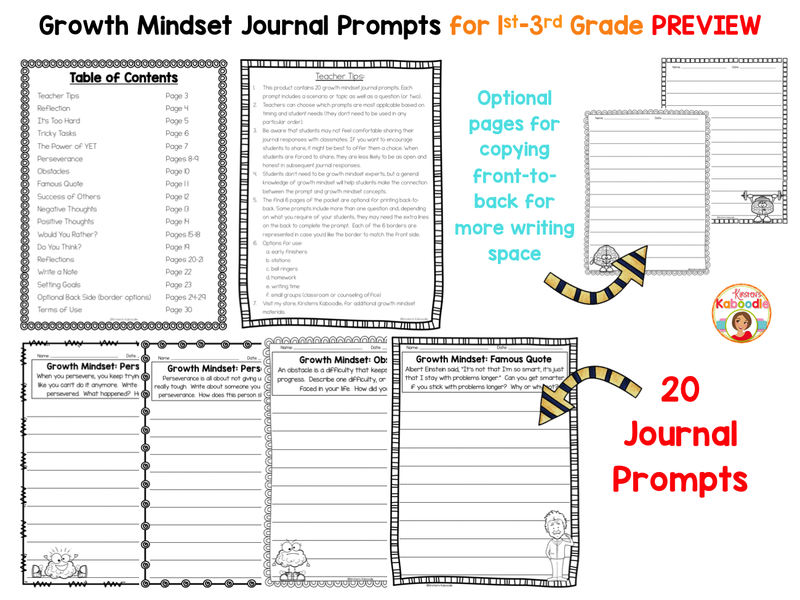 Please note that if your students are not familiar with fixed mindset and growth mindset, they will need some basic information prior to using these journal prompts in order to understand the connection to growth mindset. This might mean that you give a brief explanation for each prompt prior to completing each activity. There are 20 different journal prompts as well as a page for teacher tips, and optional back pages (blank lines if you choose to copy front-to-back for students to have extra space to write). As of 1/9/19, this product includes a digital option (as well as the no prep printable option). The instructions for utilizing the digital portion appear at the end of the packet. Only need access to Google Drive–no outside links to worry about! These journal prompts can be used with iPads, chrome books, laptops, and desktops as long as your students have access to Google Drive or Classroom on a device. The digital portion of this product is on Google Slides. 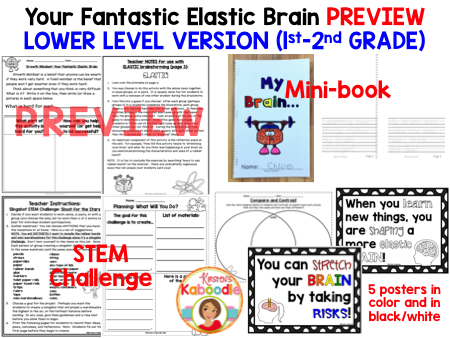 Infused with reflections, challenges (including a STEM challenge for creating slingshots using rubber bands), a mini-book about the brain, and opportunities to learn about growth mindset, your students are sure to learn and have a great deal of fun! There are 22 different affirmations included. 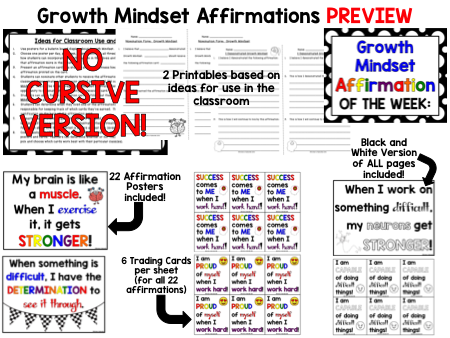 Each growth mindset affirmation comes in full-color poster size, black and white poster size, full-color trading cards (6 per page), and black and white trading cards (6 per page). Two printables are also included as well as 8 pages of bulletin board letters (G-R-O-W-T-H-M-I-N-D-S-E-T) in rainbow colors that match the posters if you choose to create a bulletin board. 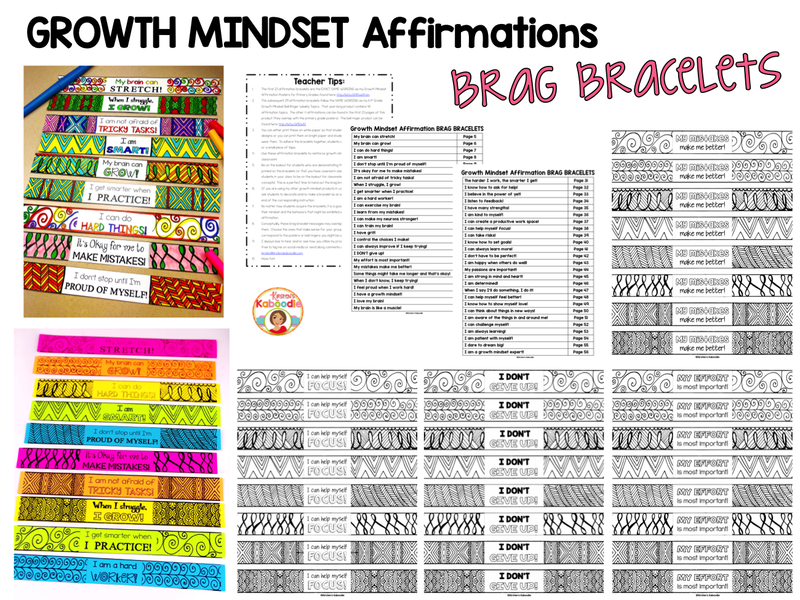 These Growth Mindset Brag Bracelets are perfect for teachers who are looking for a fun and easy tool to supplement their instruction on growth mindset. There are 52 different growth mindset affirmation bracelets included. This file contains over 350 pages.